Kitoion association aims at prevailing kitoion-process technique that is 100% natural and environmentally friendly and contributing to comfortable and better lives. The problem of an odor of clothing accounts for a large percentage in our lives. It is the problem that dies hard even to consider various measures. Kitoion association proposes development of products using kitoion- processed clothing that prevents the growth of germs even after washing. and the growth of germs. We use kitoion-process to 100% natural cotton and realize fully natural underwear that has antibacterial and odor-resist functions. 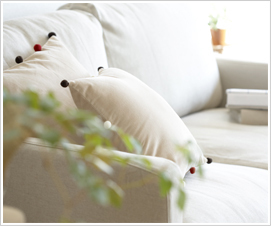 They are used everyday, but are not washed everyday so that antibacterial and odor-resist functions are very important. 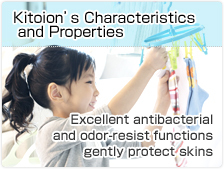 Antibacterial function of kitoion-processed clothing lasts for long time and it also exercises for an odor. 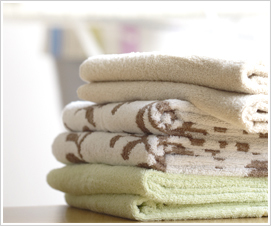 Towels are used everyday, but we do not want to use them with even a little odor. They are used for clean skins like after bathing or washing a face, so the growth of germs is also worried. 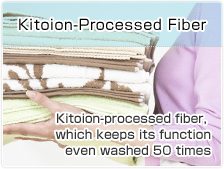 Kitoion-processed towels prevent odor and the growth of germs, and its functions last for long time. 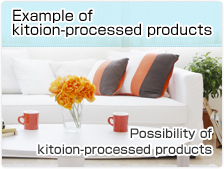 Kitoion-processing is natural and gentle for skin, so it can be used safety.